September 29th & 30th was the Tuckerton Duck and Decoy Show at Tuckerton Seaport. Always a blast! Love sharing information with all the wildlife enthusiasts, while checking out all the other vendors, and interesting and fun events. 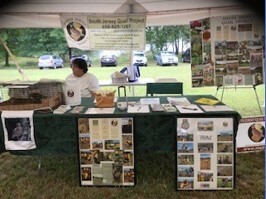 Wild Birds Unlimited in Sicklerville, NJ was on Saturday, September 15th. 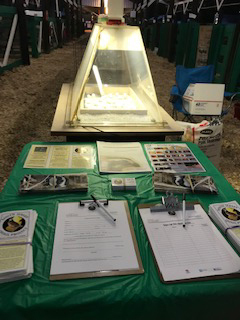 Exhibiting our Bobwhite, distributing material and making a difference in many the bird lover’s day. WBU conducted bird feeder cleanings the month of Sept. and donated a portion of the proceeds to SJQP! We are very grateful to have generous partners such as this! Thank you very much! 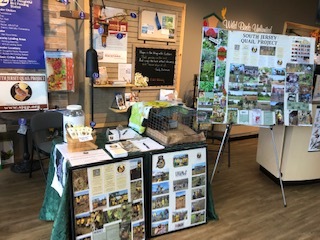 Tuesday, September 11th, we were at Salem County Nature Club in Alloway Municipal Building, Alloway, NJ sharing the plight of the Bobwhite with nature buffs, interested in knowing the history of the Bobwhite and what they can do to help. A little rain doesn’t dampen our spirits! 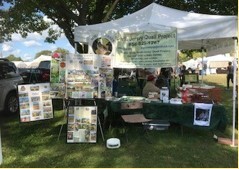 We met so many wonderful people and educated many more at the NJ Wild Outdoor Expo in New Egypt, NJ on September 8 & 9! We learned a lot, too! So worth the time and effort! And had fun! We did a presentation to participating children of club during Hooked on Fishing Not on Drugs in Port Norris, NJ on Tuesday, August 28th. Exposing the kids to the Bobwhites and getting them interested in helping in the cause. Atlantic County Fair was in Mayslanding, NJ, August 9th -11th. 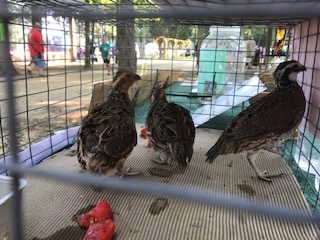 Again the SJQP provided Bobwhite hatching eggs for the Fairgoers to see and experience. These tiny chicks piqued interest and revived memories for all who saw them. Maurice River Twp, Family Night Out in Leesburg, NJ was on Thursday, August 9th. A fantastic gathering of families and friends, sharing food, festivities, and of course fireworks! The Bobwhite were reminiscent to many. Information was provided to many children and their parents who had never seen a Bobwhite Quail. Saturday, July 28th was Pollinator Day at Wheelabrator Technologies in West Deptford. Beautiful day for conservationists, birds, bees and butterflies too. 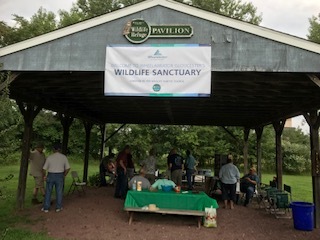 We joined our partners, NJ Audubon, Tall Pines to provide information and awareness that our efforts benefit all species, insects and wildlife, too. Cumberland County Fair was held in Millville, NJ, July 3rd - 7th. 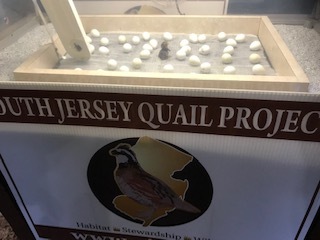 SJQP had the honor of providing Bobwhite Quail hatching eggs for exhibit in the main incubator. Fair goers were fascinated and amused as they watched and waited. Thursday June 14th, we had a presentation at Gloucester County Nature Club. It was another wonderful gathering of environmental aficionados eager to learn of our mission and assist in the plight! Our first event of the year was Winter Eagle Fest at Mauricetown Fire Hall on 2/3. 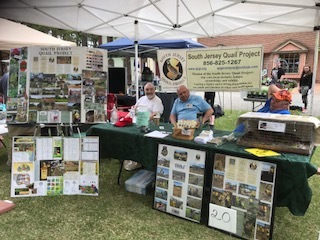 SJQP has been annually setting up a display table to promote our efforts and celebrate with other bird lovers of all ages while sharing Bobwhite Quail facts. 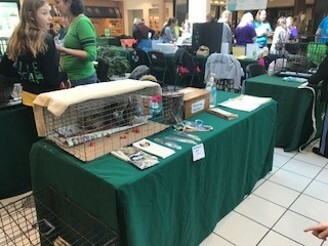 SJQP exhibited some quail and educated the public at the Cumberland County 3H Mall Expo on 3/10 at the Cumberland Mall. We always have a great time with the kids from our associate, Poultry Pride 4H Club. 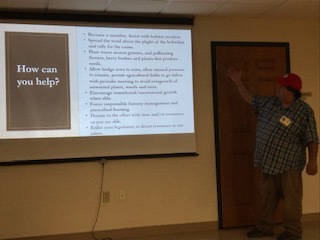 On 3/14, SJQP gave their presentation on the Plight of the Bobwhite Quail at Citizen's United for the Maurice River and its Tributaries at Cumberland County College. SJQP was an exhibitor at the Sportsman Show at Mauricetown Firehall on 3/24. We distributed information and displayed a few quail for numerous area sportsman/women and like minded conservationists. 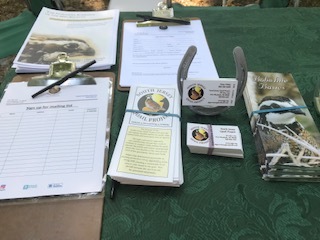 We shared educational tidbits and information on what individuals can do to assist in the fight to bring the Bobwhites back at the Eco-Fair at Wheaton Arts and Cultural Center on 5/5. Board members from SJQP attended the Division of Fish and Wildlife Freshwater Fisheries Forum on Sat. 2/18 at Batsto Village where they learned about the research and management plan with regards to the freshwater programs as well as had the opportunity to discuss with Division officials how SJQP and the Division can work together to advance our mission! Great things are happening! 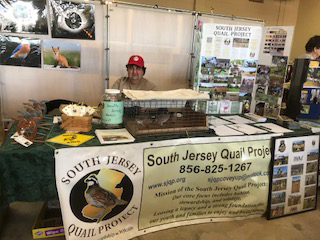 SJQP along with our exhibit quail spent time at several 4H events. So far, they have made appearances at the 4H Mall Expo, Tractor Supply Chick Days and backyard poultry event, and the 4H Pet Fair. We are introducing the quail to children who have never seen them before, and reminding their parents and grandparents who may have forgotten. Enabling these children to see and experience the quail puts us one step closer to bring them back. Poultry Pride with the South Jersey Quail Project at sold bookmarks, decals and pins. 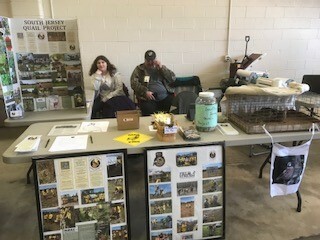 Collecting club donations and educating the public on chick and chicken care, and the plight of the Bobwhite quail. Great job kids! Instilling an appreciation for this creature in children paves their path into the future. SJQP participated in the Eco Fair at Wheaton Arts and Cultural Center in Millville. What a great day! This sparked continued attention to our mission with new members and donations of which we are grateful! SJQP is a 501c3 non-profit organization and dependent on donations for our sustenance. 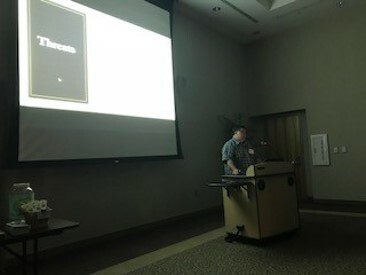 We were able to speak with and educate many people in our undertaking. 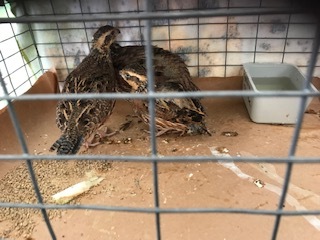 Everyone loved seeing our special guests, a trio of beautiful Bobwhite Quail. Some had never seen a Bobwhite before, many remember hearing them when they were young, and everyone misses hearing them now.